The holes in Emmental cheese are so characteristic of the Swiss brand, their diameters are officially fixed by the US Food and Drug Administration. The reason for the holes is that in fabrication of the cheese, the addition of the Propionibacterium shermani causes the release of carbon dioxide. 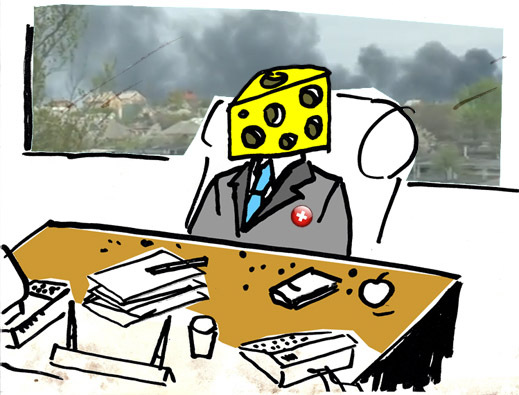 When the wheels of emmental are broken, the bubbles burst, leaving behind the holes. The Swiss call it the jolly bacterium (P. freudenreichii). 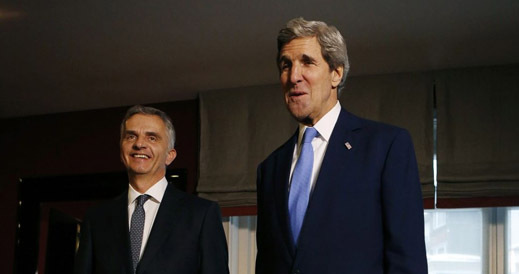 Didier Burkhalter, President of Switzerland, and also Chairperson-in-Office (CiO) of the Organization for Security and Cooperation in Europe (OSCE), hasn’t been feeling so freudenreich lately with these two titles, whose tenures run out, both of them, on December 31. 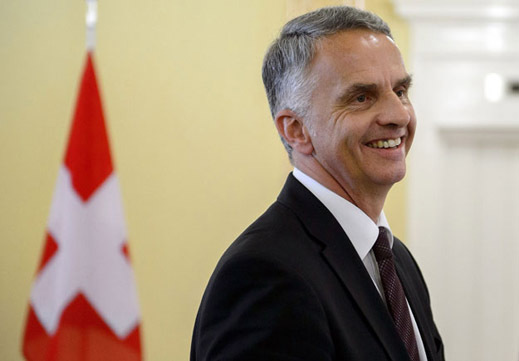 Burkhalter, 54, from the centre-right Liberal Radical Party, started cheerfully enough when as foreign minister in the Swiss Federal Council, he won enough votes for the annual rotation of the presidency on December 4, 2013. When Burkhalter, a native French-speaker from Neuchatel, is feeling freudenreich, his smile goes up on the right side. When Burkhalter is less freudenreich, his smile goes up on the right side, but his grin turns down on the left. When he becomes anxious, his jaw and lips clench, and his mouth drops on the left side. When Burkhalter is really nervous, his mouth turns down on left and right. Burkhalter delegated the Ukrainian operation to three deputies of Turkish, British and Swiss nationality; in the past all three have been engaged in military pacification of territories at war. The SMM’s public reporting and transparency function was assigned to a Canadian from the western Ukraine with a record of published diatribes against Russia; they stopped when his OSCE salary commenced. Their backgrounds, careers and political orientations were examined here. 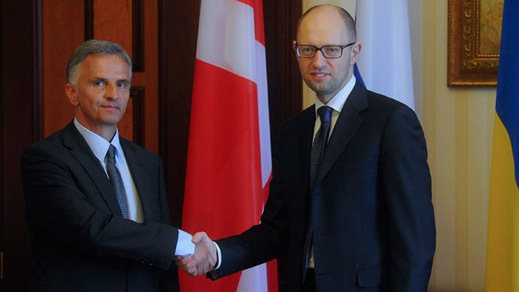 By reference to the Geneva Statement of April 17, signed by the US, the European Union, Russia, and Ukraine, Burkhalter’s roadmap appeared be comparably balanced. For example, the Geneva Statement’s reference to the OSCE appeared to require the OSCE’s “Special Monitoring Mission [to] play a leading role in assisting Ukrainian authorities and local communities in the immediate implementation of these de-escalation measures” (emphasis added). In the OSCE release Burkhalter said he had agreed with Kiev on the appointment of a German, Wolfgang Ischinger, to implement the process of dialogue, or round tables, between the government in Kiev and the separatists, federalists, and Russian-speakers in the south and east of the country. There is no record that Ischinger’s appointment was discussed in the telephone-call with Putin, or approved in Moscow. 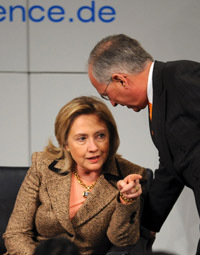 Ischinger (on the left of Hillary Clinton), a former German ambassador to the UK and the US, is known in Germany as an “Atlanticist”, which is diplomatic slang for pro-American. His job as chairman of the Munich Security Conference (MSC) depends on it. In the role Burkhalter had assigned him, Ischinger managed just three round-table sessions – in Kiev, Kharkov and Nikolaev. Burkhalter announced “The launch event [in Kiev], chaired by two former Presidents of Ukraine, Leonid Kravchuk and Leonid Kuchma, allowed for constructive and engaged discussions and set the tone for the following editions to take place in the regions.” The roles Bukhalter endorsed for Kravchuk and Kuchma were roundly criticized by the regional invitees, as well as by groups in the southeast of Ukraine whom Ischinger did not invite. 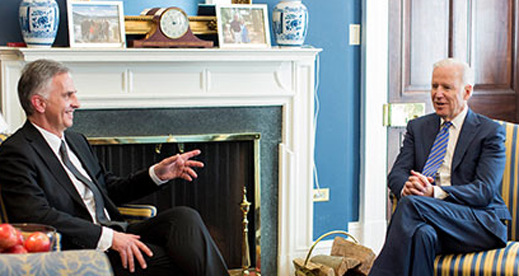 In Washington the State Department briefer, Jen Psaki, dismissed the Russian concerns. “I’m not aware of those complaints”, she said on May 22. While no replacement for Ischinger has followed, and no new round table either, Burkhalter has announced the appointment of a Swiss diplomat, Heidi Tagliavini, as the OSCE representative for the “contact group”. This also comprises the Ukrainian Ambassador to Germany, Pavel Klimkin, and the Russian Ambassador to Ukraine, Mikhail Zurabov. contact group had been explicitly requested by the new Ukrainian president Petro Poroshenko. 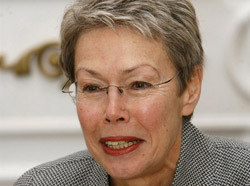 Tagliavini’s appointment to the new OSCE role in Ukraine has been criticized by Georgia’s ex-president Mikheil Saakashvili. He has called her «подсунуть свинью» (a pig in a poke). Q: President Burkhalter has made several public statements endorsing the sovereign right of Ukrainian forces to attack civilian areas of the country, particularly the districts in and around Slavyansk, Lugansk, and Donetsk. Is it President Burkhalter’s view that the Ukrainian military operations in those areas are under the control of the government in Kiev? What is Mr Burkhalter’s assessment of the reasons and justifications in international law for the destruction by these operations of water, electricity, heating, food supplies, telephone, and other infrastructure serving civilian life in these areas? A: “We are not aware of any such statements by the CiO. The CiO, since the beginning of the Ukrainian crisis, has called for dialogue and de-escalation in order to promote a peaceful resolution of the situation”. Q: What is the OSCE count of the numbers of refugees flowing out of the areas of military engagement, and what is the OSCE’s assessment of the causes of this outflow? 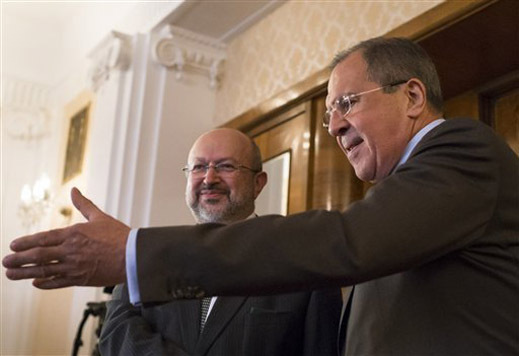 Q: Yesterday [June 11] Foreign Minister Lavrov told [OSCE] Secretary-General Lamberto Zannier that “we consider counterproductive any attempts ‘to pick and choose’ separate elements from the ‘road map’, without paying attention to the others, or to substitute for this document new plans having unilateral and unbalanced character. We are convinced that the Acting Chairman of OSCE [Burkhalter] – the author of ‘road map’ – and his special representatives, whom he appoints and still can appoint, must adhere strictly to the balanced, compromise, integrated approach stated in the specified document.” How does President Burkhalter respond to this criticism? Burkhalter was then asked to amplify his answers where the spokesman had been misleading or mistaken. Q: In response to Question 4, you have provided a link which is a list of names of OSCE functionaries. Would you please explain how this responds to the question asked? Q: In order for President Burkhalter to answer Question 5, and respond to Foreign Minister Lavrov’s statements, I refer to the verbatim record of the Minister’s remarks, issued by the Russian Foreign Ministry at 1400H yesterday June 11 — http://www.mid.ru/brp_4.nsf/0/AB223E601B9F6AD844257CF4004F1F43. In the event that your Secretary-General lacked a note-taker or interpreter, I invite you to make your own translation of the Russian, noting that the English translation I provided you was a courtesy, not a “media report”. Burkhalter and his spokesman have refused to reply. Two days late, Burkhalter authorized the OSCE website to disclose that Secretary-General Zannier had met Lavrov in Moscow.